Coloring, dancing, eating and laughing? There’s more than one way to evoke a Good Mood at Grace Ridge! Walking into Grace Ridge’s Color Me Happy party on Feb. 12, it was impossible not to break out in a smile that spanned from ear-to-ear. Tables were strewn with markers, pencils, baggies filled with sweet snacks, crisp white paper and bright blue, yellow and orange paper hats scrawled with feel-good quotes. Good mood-inducing songs like the Happy Days theme and Beach Boys’ “Good Vibrations” played, while colorful helium balloons bounced around the room and the scent of homemade chili wafted through the air. 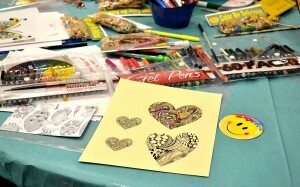 Organized by Evelyn Beaver, director of life enrichment, the event was a coloring party and art lesson rolled into one. An artist and painter, Beaver demonstrated how to shade and blend colors and also highlighted the importance of lighting and paper quality. Resident Gay Nelson loves coloring so much she has two full bags of books she works on nearly every day. Most of her collection of completed works is stored in clear page protectors in three-ring binders, but her favorite pieces are proudly displayed in frames throughout her home. Some attendees took their coloring seriously – mixing colors, shading and meticulously coloring intricate designs. Others preferred simple, color-by-numbers designs that focused less on staying in the lines and more on socializing. 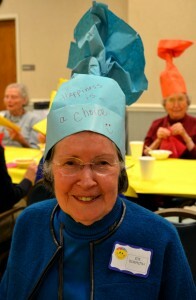 Either way, the Color Me Happy event proved to be a sure-fire way to put Grace Ridge residents in a Good Mood.